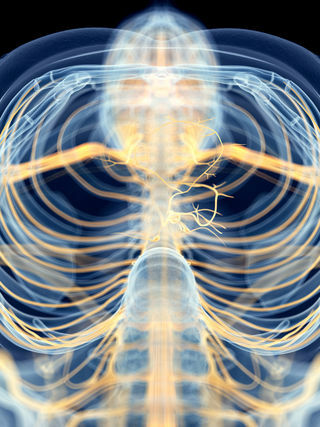 The vagus nerve helps to regulate heart rate and is also a key player in our social engagement systems. Long before modern-day researchers were studying the science of human emotion and loving-kindness as being linked to the vagus nerve, scientists were interested in how vagal tone affected the physiology of the heart. When you inhale, heart rate speeds up a bit and when you exhale, the release of acetylcholine—which was originally referred to as vagusstoff (German for “vagus substance”)—slows your heart rate down and prepares your body to “rest-and-digest.” A healthy heart is also marked by a high rate of variability (HRV) as you breathe in and out. “In 2010, research scientists Barbara Frederickson and Bethany Kok of the Max Planck Institute for Human Cognitive and Brain Sciences published their landmark study, “Upward Spirals of the Heart: Autonomic Flexibility, as Indexed by Vagal Tone, Reciprocally, and Prospectively Predicts Positive Emotions and Social Connectedness,” in the journal Biological Psychiatry. – Excerpted from the article “Kindness Towards Oneself and Others Tones Your Vagus Nerve” in Psychology Today. These are the principles on which the Radiant Human Meditation practice are founded. You can find RHM meditation on InsightTimer App or download it free from our store.